"Discover the MTSU difference. Become True Blue." Founded in 1911, Middle Tennessee State University (MTSU) is one of the oldest and largest public universities in the state with an enrollment of 22,000 students. MTSU is the #1 choice of undergraduate students in Tennessee and occupies over 500 acres at the geographic center of the state in Murfreesboro. Nashville, the state capital, is only 30 miles away. 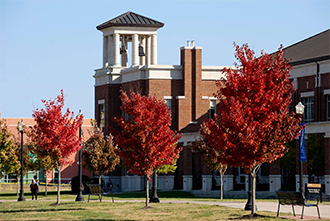 In its earliest days, MTSU was a teachers college and still educates more teachers than any university in Tennessee. It has one of the largest Recording Industry programs in the nation, strong reputations in business, aerospace, nursing, and mass communication, and a lasting commitment to the sciences and liberal arts. Middle Tennessee State University's online program has received an OLC Quality Scorecard Endorsement from the Online Learning Consortium (OLC). The OLC Quality Scorecard uses research-based benchmarks and standards of excellence to help higher education institutions evaluate their online learning programs. Institutions use the scorecard to determine strengths and opportunities for improvement of their programs, and to initiate planning efforts to address areas that require enhancement. In addition to giving an institution a means to convey confidence in the quality of its programs to prospective students, the scorecard can be used to demonstrate the quality of online programs to higher education accrediting bodies. Plus, it can serve as an internal planning tool for institutions launching new programs or transforming mature programs. The OLC interactive Quality Scorecard is completed by the institution and submitted for peer review along with evidence to support its submission. After a thorough review process, the institution receives a final score along with prescriptive feedback from the three-member peer review team. Institutions scoring 180 or higher are granted OLC’s Seal of Endorsement, which is valid for a period of two years. Since 1999, OLC (formerly known as Sloan-C) has been the leading professional online learning society devoted to advancing quality e-Education into the education mainstream. MTSU holds the distinction of being recognized as a 2017 Military Friendly® higher education institution for exemplary practices in recruiting and supporting post-military students. MTSU is designated as a Silver recipient which means its programs are ranked within 30% of the 10th ranked Top 10 institution.